One of the newest trends in kitchen design combines elements from both traditional kitchen design and contemporary design to create an entirely new look. Known as transitional design, these modern kitchens incorporate the sleek, straight lines of contemporary design with the layers, curves and softness of traditional design. The result is a modern, clean look that’s also warm, inviting and infinitely practical. 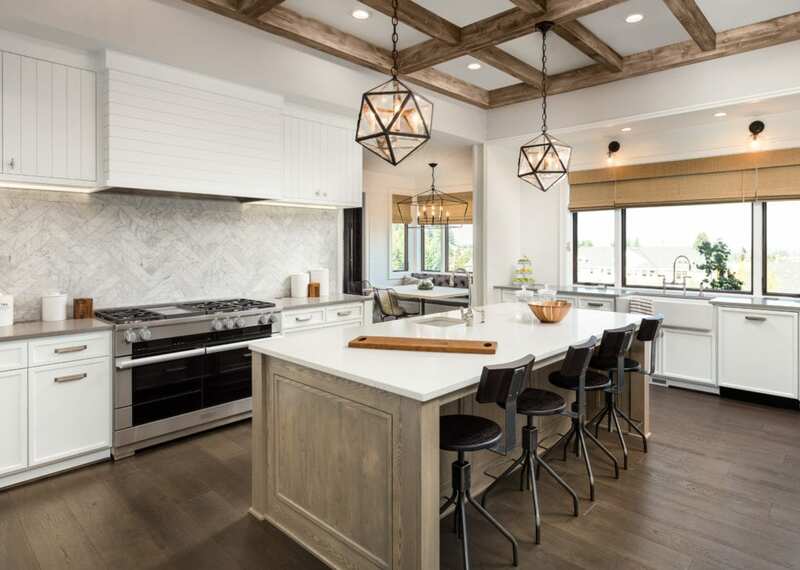 Notice how the kitchen pictured here makes use of clean, straight-lined cabinetry, combined with a geometric light fixture and natural fabric valences to create a cozy space with a touch of modern style. While wood cabinetry has long been a timeless tradition, many homeowners are opting for simpler, painted cabinetry these days. White cabinetry continues to be a popular choice, but the most popular colors for painted cabinetry right now are grey or dark, neutral tones. These colors work nicely with solid surface countertops, colorful appliances, and other modern kitchen design elements. Homeowners have moved away from ornate, raised or contour panel cabinetry, in favor of the clean lines and simple style of flat cabinet doors. These doors feature a flat center panel that is recessed, rather than raised. Flat-style cabinetry works in just about any kitchen from traditional and contemporary to the more recent transitional styles. Flat-style cabinetry is available in both hardwood and painted styles. While kitchen islands have remained a popular kitchen focal point for decades, older islands often feature multiple levels for both seating and food preparation. The latest trend is single-level islands that provide extra space for food preparation and seating, all at the same height. The single-level design feels more open and inviting, making the island an attractive, yet simple centerpiece that’s perfect for homes with open floor plans. Another growing trend is kitchen designs that feature very few or no upper cabinets. This gives homeowners extra open space for splashy wall colors, artwork, bookshelves or cookware displays. The open, modern design also provides instant access to pots and pans, spices, bowls or other accessories. While most kitchens still feature a stainless steel or white enamel sink, there is a growing trend towards colorful kitchen sinks in many modern kitchen designs. Color choices range from muted neutral tones to bright, cool or warm tones. Colorful sinks can be created from granite to either complement or match the homeowner’s countertop design. Enameled cast iron sinks are also available in a wide variety of fun, exotic color choices from red and yellow to key-lime green. Solid surface countertops like granite and marble have been popular in kitchen designs for quite a while. But man-made quartz countertops have increased in popularity in recent years. Unlike granite and marble countertops that are made from natural stone, quartz is manufactured using quartz, resin and a variety of pigments. In many cases other materials such as stone, metal or glass are added to create variations in appearance. Quartz countertops are stain and scratch-resistant and are completely non-porous, so they don’t require sealers like granite countertops do. The non-porous surface also resists bacteria, mold, and mildew, making quartz countertops a cleaner choice. Plus, advanced technology has made quartz a more versatile material than ever. Quartz countertops can have a completely monochrome appearance or be created with a dizzying array of patterns, colors and textures. While ceramic tile has long been a practical choice for kitchen flooring, digital technology is making ceramic tile a more versatile option than ever before. Ceramic tile manufacturers are now using techniques adapted from the inkjet printing industry to create tiles that mimic natural materials so closely, even professionals can’t tell the difference. It’s now possible to create the look of marble, hardwood, or even Mexican Terraza using dimensional effects that weren’t possible even a decade ago. Further advances in technology have made different tile sizes possible, too. Tile manufacturers are now able to create large, thin tiles, up to 3-by-10 feet and just 3 millimeters thick. The larger sizes mean less grout lines and a more integrated design. The thin tile size means that it’s now possible to install ceramic tile over existing flooring. This cuts down on installation labor considerably, making tile a more economic choice in many older homes. Plus, ceramic tile is waterproof and virtually indestructible, making it much more suited to kitchen areas that endure high traffic, spills and other mishaps. It’s easier than ever to illuminate food preparation areas with under-the-cabinet LED lighting fixtures. LED lighting is small, and easy to install. Plus, LED lights can last for decades without changing a single bulb. LED bulbs are also a popular choice for pendant lights, chandeliers and ceiling fixtures in many modern kitchen designs. Hands-free faucet sensors, hydraulic cabinet and drawer hardware and even self-closing cabinet doors are making their way into many modern kitchens. Homeowners love being able to wash their hands or rinse their pasta without the need to turn on the spigot manually. Slowly-closing cabinet doors and drawers reduce wear and tear on cabinetry and provide added convenience, since they close completely with a simple push. So which kitchen design trends are your favorites? We’d love to hear what you’re considering for your new kitchen. Add your ideas to the comments below! Need help with your kitchen upgrade? Red Rose Cabinetry is here to help with every aspect of your project from the latest in quality kitchen cabinetry to complete kitchen remodeling from start to finish. Visit our showroom in Lititz, PA to see a wide range of styles, colors, finishes, and hardware options to suit any budget!